Mississipi is the one Pussycat song most North Americans have any knowledge of. Released in 1975 and written by Werner A. Theunissen, Mississippi made an impression in many places. With lead vocal by Tony Willé (nee Kowalczyk) and joined by older sisters Betty and Marjan, and husband Lou Willé, John Thuenissen, Theo Coumans, and Theo Wetzels, the song is evocative of that wide rolling river. The lyrics end 'if ever I should go away, I'll be longing for that day, when I will be in Greenville again'. It was the first single, backed with Do It which also appeared on the debut album by Pussycat, based in Holland. 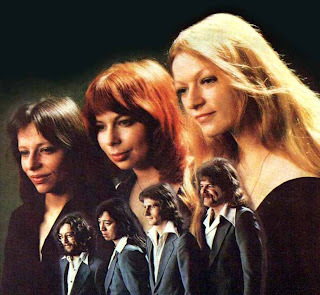 As with all her future albums Tony sang in English, but also (like the Beatles in the early days) recorded German versions which were popular in that market. Georgie was the next single taken from the album 'First Of All' and also found a highly receptive audience in Europe but did not seem to reach America. Neither did stand out album tracks Mexicali Lane and Help Me Living On. 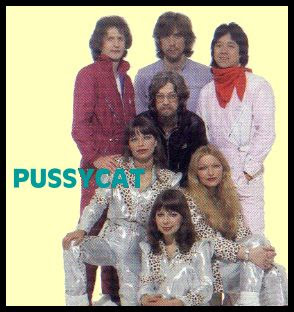 Pussycat was contemporary with such other international groups as Abba and Fleetwood Mac (Buckingham & Nicks incarnation), but also showed a country twang (Nothing To Hide written by Eddy Hilberts) and sometimes some organ work (such as on I Long To Hear Your Footsteps), and a bit of the harmonies of the Everly Brothers. The next album 'Souvenirs' was if anything better than the first with the singles Smile and My Broken Souvenirs topping the charts in 1976 and 1977. The Souvenir album also included other stand outs with Tony and sisters up front, I'll Be Your Woman, The Easy Way, Get It Higher, Home, and You Don't Know (What It's Like To Be Near). Also offered was Someday, an interesting honkytonk country ballad with Lou Willé vocals. All but one song were written by Werner Theunissen. Above are Betty, Marjan and Tony, and the men are guitarist John Theunissen, Lou Willé, Theo Wetzels, and drummer Theo Coumans. In 1978 the single and album Wet Day In September were released and the album offered other hits with If You Ever Come To Amsterdam, and the country style Hey Joe (no connection to the late '60s Hendricks staple), Another Day, To Lovin', I Must Get You and Love In September (written by Eddy Hilberts). Already various 'Best Of' albums were being issued to meet the European demand. The next album included the upbeat hit Doin' La Bamba, Let Freedom Range (a very stirring tribute to Martin Luther King Jr. with Tony at full strength), Stranger In Town, Alleghenny, and On The Corner Of My Life (a title taken from a line of an earlier song). The next album, 'Blue Lights', featured a closeup of a kitten instead of the band, but you can see them reflected in the cat's eyes. Thuenissen's And Then The Music Stopped and Teenage Queenie charted as singles, as did Une Chambre Pour La Nuit. The title song is also notable. Following this, the band was reduced to the sisters and Lou Willé due to costs of touring. The single Take A Look At Me was released by Pussycat as a foursome in 1982. The last Pussycat album, 'After All', was a thinner assemblage, and only one single from it charted, which was Lovers Of A Kind. Meanwhile 'Best Of' albums continued to appear and sell, and two new singles appeared following 'After All'; Roll On Mississippi, and Light Of A Gipsy. Following that last Pussycat single's release in 1984 Tony's sisters had had their fill and Pussycat dissolved. Tony went solo the same year, covering songs by Chris Rea and Anne Murray among others on her first album. Two more solo albums appeared to some success in the next few years, a light pop ballad approach was taken with some country and sometimes a bit of Spanish influence. The original family name of the sisters was Kowalczyk and they came to Holland from Poland. The sisters performed as The Beat Girls or The BGs From Holland as well as recording as Sweet Reaction, and Tony alone as Sally Lane (with the single Let Me Live Again). Lou Willié was part of a skiffle type rock band as Ricky Rendall and His Centuries, while Theo Coumans, John Theunnisen and Theo Wetzels made up a more R&B styled group called Scum in the 1960s. The magic of 'Mississippi' and 'Souvenirs' is in the past now, linked to the late seventies. 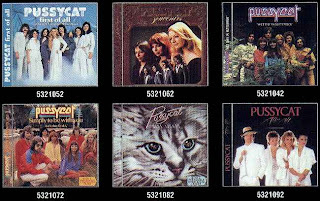 Yet the recordings of Pussycat are still lush and fresh to the ear today, well produced by Eddy Hilberts and with the subtle and original stylings of Werner Theunissen and Tony. A two record set titled Gold released in 1985 summed up the band's and Thuenissen's career. All the individual Pussycat albums have been released on CD in 2001 by EMI with bonus tracks added.